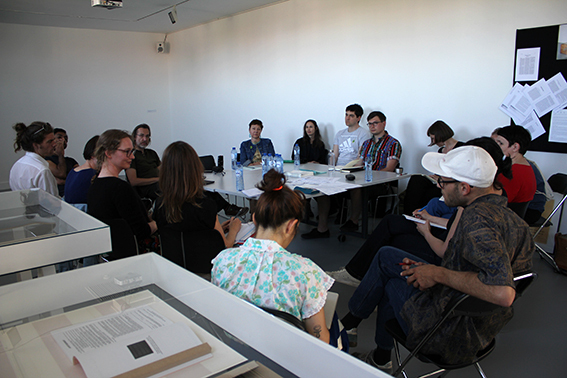 Collective reading and discussion session in the context of CAVEAT!!! The concept of immaterial labour, as it was introduced and developed by, among others, Maurizio Lazzarato, Paolo Virno, Antonio Negri and Michael Hardt, how stimulating its discursive production may have been in many respects, almost automatically leads to a debate on the supposed difference between two types of labour, material and immaterial labour, as well as to the self-deconstructive clause that, in fact, it is quite difficult to distinguish between these two types. If, however, the crucial insight from this debate is that all labour tends to become performative, then it makes sense for theory not to focus any longer on the articulation of the difference between material and immaterial labour, to give up the struggle with the bad binaries of a hopeless ontological discussion, and to begin to imagine the consequences of the general tendency of the becoming performative of labour. Sven Lütticken's concept of general performance allows to operate a strategic shift in the twenty something year old discourse on immaterial labour. Not only has performance become general, but even more so, performance has become permanent. Labour today is characterised by a regime of 'permanent performance'. However, the basic discursive operation implied by the introduction of the concept of permanent performance, as different from Lütticken's concept of general performance, is that it re-inscribes a notion of (measurable) working time into the debate on contemporary labour. This notion had been evacuated from the debate by the debate's initiators, as a consequence of the idea that post-Fordist productivity can no longer be measured. Thus, time as a system of measurement par excellence became a non-issue, whereas in the ordinary lives of the multitude, it is in fact a very important issue.